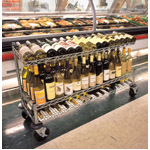 Metro Wine Cart is perfect for use in a store display or in your own home. Wheels make the cart mobile therefore making it easy to maneuver into the perfect spot for your display. Measures 14D x 36W x 27H”. Safe Storage of Wines: Each bottle is supported individually in a cradle formed by the wires of the shelf, so it cannot roll or bump against adjacent bottles. The top of the wire “snake” acts as a natural back stop when placing bottles on the shelf. High visibility: Open wire construction keeps bottles and labels highly visible for easy reading and selection. Large Capacity: Cradle wine shelving is available in four standard units, all 14” wide. Chrome-Plated Finish: Attractive and clean. Metro Wine Cart is perfect for use in a store display or in your own home. Wheels make the cart mobile therefore making it easy to maneuver into the perfect spot for your display. Measures 14D x 36W x 27H".